How to get there: This mountain is most easily accessed from the upper part of the Sjoa valley. Drive E-6 north to Sjoa, then Hwy. 257 32 kilometer west to Randsverk. From here, drive Hwy. 51 south for about 15 kilometer. You should stop before getting to Hindsætri. I parked at a small turnout (holds only one car) near Steinholet, location N61:37.640, E008:59.271, elevation 872 meter. Route description: If the snow supports your skis, then ski directly across the Sjoa valley and find a reasonable route up the birch forest at the other side. 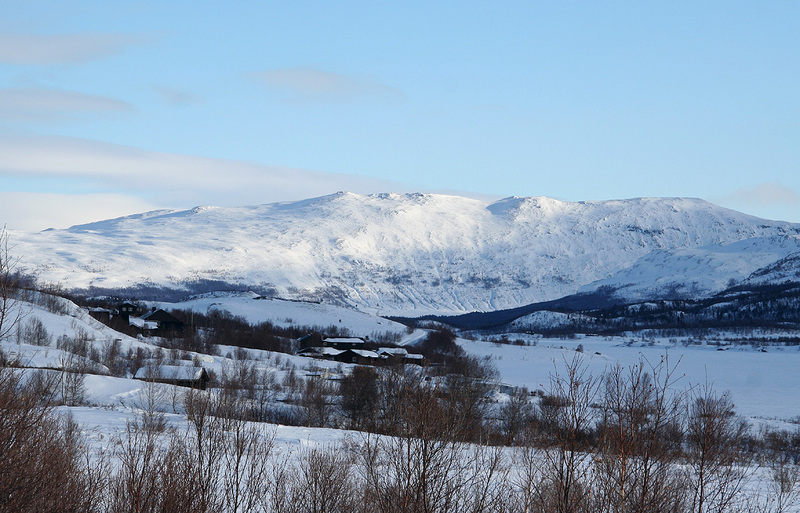 If the snow is loose, then ski until you hit a groomed ski track, follow it north (left) to the Eldbuholmen area. From here, locate a ski track that runs uphill to the small building called Sallii on the map. 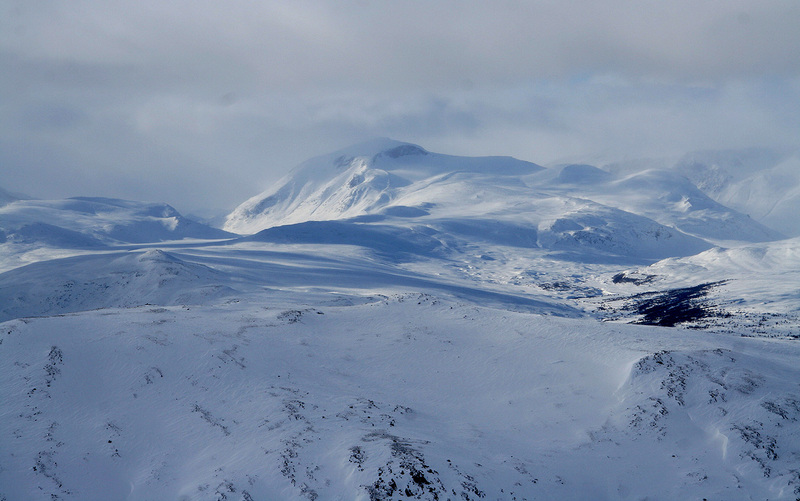 The ski track follows the same route as the summer trail marked on the M711 map. Take the right fork shortly above Sallii and head south until you get above the trees. Continue more or less directly towards the summit, but stay west (and well below) of point 1454. The slope is quite nice all the way, you pass a small, false summit, then directly to the main summit. Comments: I had breakfast at Gjendesheim before driving back down the Sjoa valley just past Hindsætri, where I found parking on the right hand side of the road near a place called Steinholet. This is roughly 14 kilometer from the tourist hut Bessheim. I started out (around 1015) more or less directly across the Sjoa valley and immediately discovered that the snow in this area was more than bad for skiing. Sinking to knee depth all the way, feeling that all the snow below consisted of loose sugar like snow with no structure whatsoever. The area had recently hosted a national congress for moose, tracks (deep holes!) crisscrossing everywhere. It turned out that skiing precisely on top of a moose track was slightly better, however, the moose did not seem to ever have a very consistent direction towards the mountain on the far side of the valley. I crossed a couple of groomed ski tracks, but as they where running parallel to the river it was hard to guess if one would eventually turn and climb the hillside. Just as I was about to start uphill, knowing that this would be a pretty epic struggle among the birch trees, I came upon a track made by a team on snowshoes. It lead uphill and I decided that this was my best option. Well, after about 10-15 minutes I had a more balanced view. The track was about 50-60 centimeter deep and about as wide. It was almost as unpredictable as the moose tracks below, who knows what these people had been up to? Generally, it lead uphill, sometimes very steeply, this caused considerable problems as I could not ski straight up and leaving the track caused other problems. I ended up taking the skis in my hand and walk uphill in the trench. Finally, after many strange twists and turns, this track emerged above the treeline. Immediately, the snow was more wind packed and could be skied without any more troubles. I continued uphill, the slope was very gentle all the way to the summit. The wind was partly coming from behind, but I noticed how it steadily increased as I got higher. At the summit, it was gale force and made the place very uninviting. I took a few pictures then headed back down. The time was 1300. 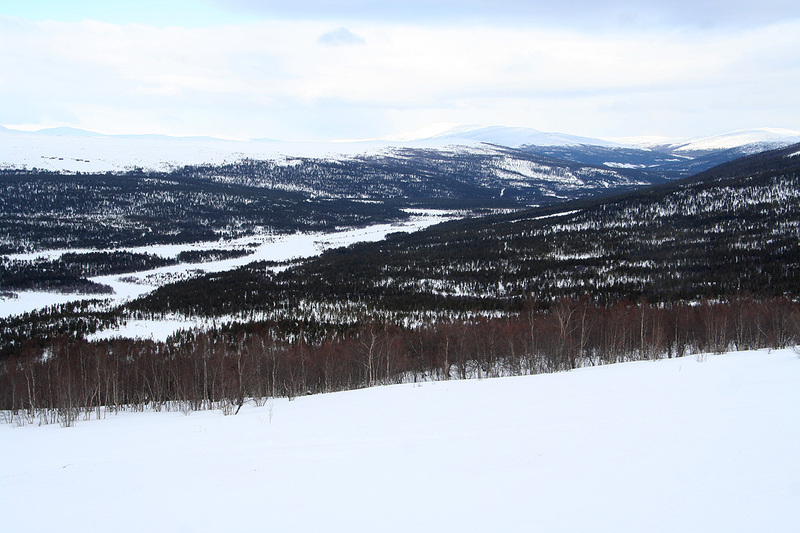 Determined to avoid the bad hillside with the birch trees, I turned more east below point 1454 in the direction of lake Sjugurdsjøen, hoping to find a ski track coming up this valley. No such luck (actually, there was a track, but on the far side of the creek), I turned more west and broke a deep trail across a large open meadow. Fortuneately, just as I crossed the summer trail, I hit a ski track following the same route. 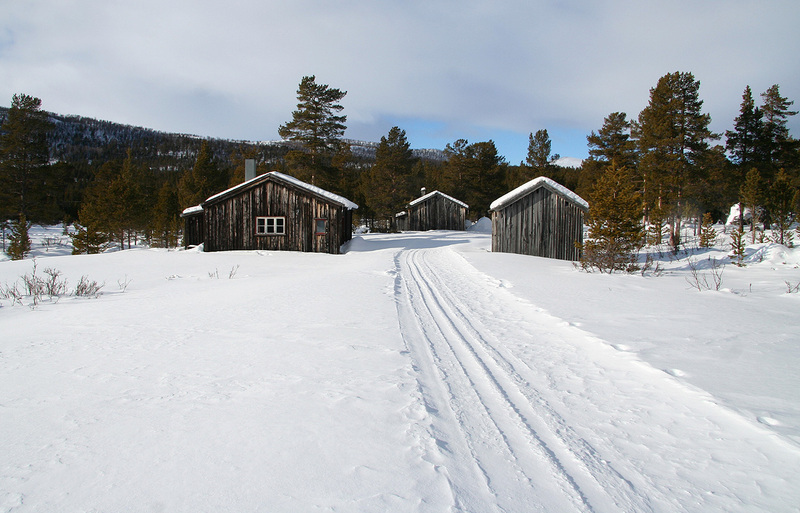 This track quickly took me down to the old cabins Sallii and then down to Eldbuholmen near the Sjoa river. I could now ski back south along a groomed track and arrived back at my car by 1415. 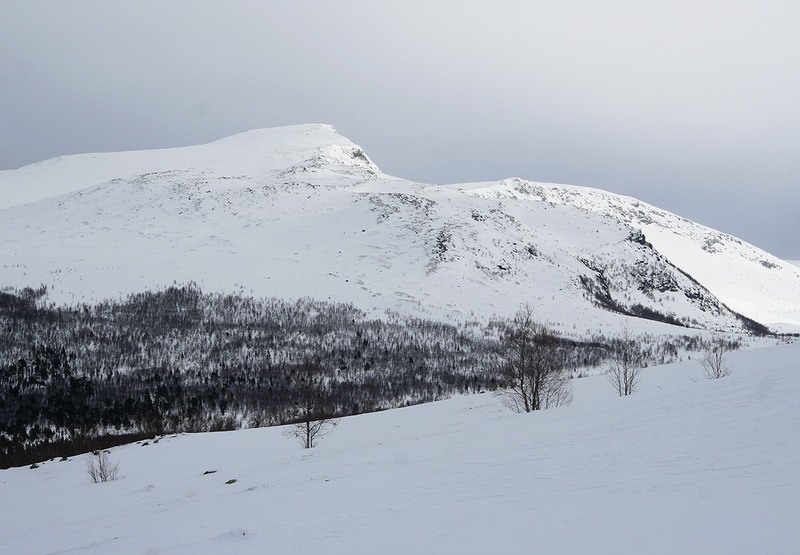 I returned to Gjendesheim for a second night, the plan was to climb Sikkilsdalshøa the next day. Dyrtjørnhøi, as seen from the road. The actual summit cannot be seen, as it is further behind on the massif. Dyrtjørnhøi, as seen from the road. The summit is in the background (a bit obscured). 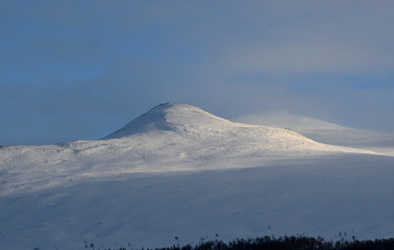 Sjugurdsjøpiggen, 1634m, as seen just above the treeline. End of trip, along the groomed track. 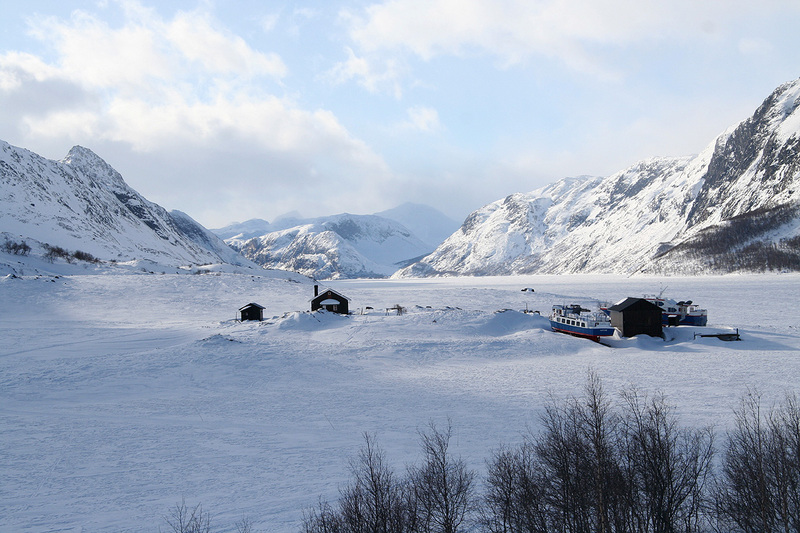 Lake Gjende, as seen from the Gjende hut. 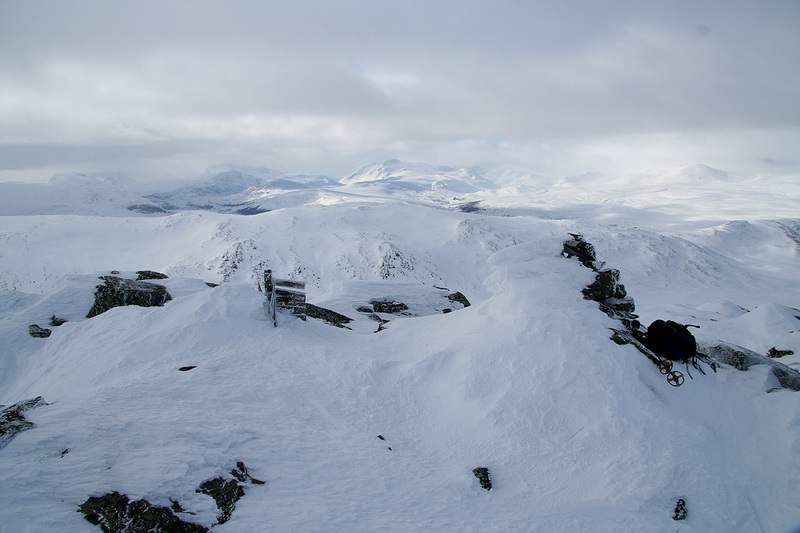 Summit Panorama, from North-West to East.